For the past half-year, I have been vacillating about whether to purchase a new Bible. Every time I went to Cokesbury in Atlanta, I drooled over all of my favorite translations. I looked at hard covers and the leather editions. I checked prices and versions. Whenever I went, I felt that I was committing some sort of adulterous act. At home, I knew my beloved Bible, the Oxford Annotated Study Bible, Third Edition, sat waiting for me to return, longing for me to crack open its pages yet again. I purchased the Bible over six years ago, and it got some great use in Bible studies, Sunday school, and sermons. 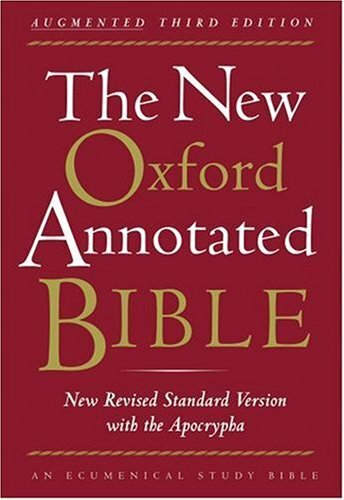 It seemed only natural, then, that if I get a new Bible, it would have to be the next Oxford edition (the Fourth Edition): Over the past fourteen years I owned a total of four Oxford Annotated Bibles. 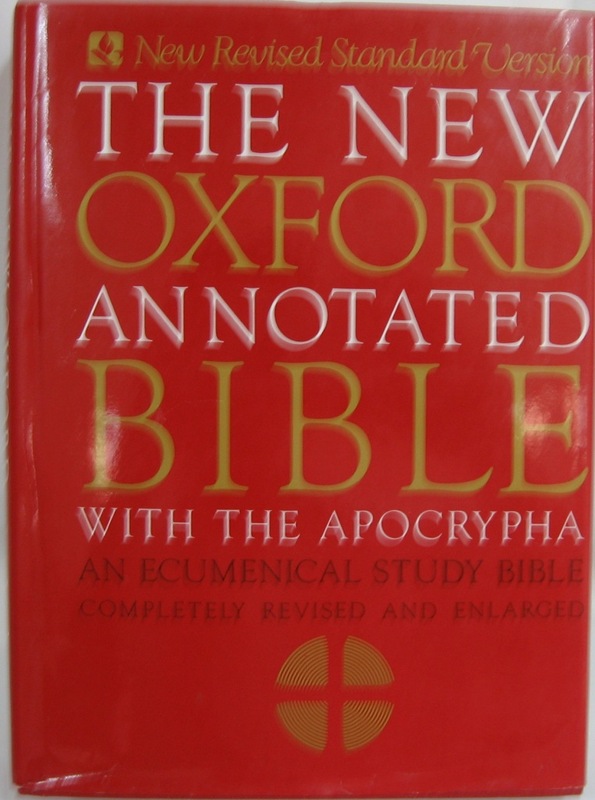 I remember the day I purchased my first Oxford Annotated Study Bible in 1996. I entered college and my religion professors required this particular version. I went to the campus bookstore and saw this behemoth of a Bible (I later learned that it goes by the nickname, “the Brick”). At the time, I was using the very popular NIV study Bible (mine had a cool DC Talk “Jesus Freak” sticker on the back cover, thank you very much). Why would I spend forty to sixty dollars for another Bible? Several reasons. For one, it had the Apocrypha, which provides historical insight from the inter-testamental period leading up to Jesus’ ministry. Also, it was the New Revised Standard Version. Unlike the NIV, which combines both literal and paraphrase translations in haphazard fashion, the NRSV is an ecumenical translation boasting some serious historical-critical scholarship. It is not perfect, but it is accurate and in the tradition of the King James Version. Upon looking at the various “versions” of the Oxford Bible available, I settled on the paperback edition. At least if I did not use it, I was not spending an arm and a leg. It did not take long before the Brick replaced all of its contenders in my life of faith. The old NIV started to collect dust on the bookshelf along with my Ryrie NASV and a waste-of-money NKJV Word of Life study Bible (which probably weighs ten million pounds) I picked up before college started. The Brick sustained me through four years of college as a religion major, one year of teaching Bible at a private school, three years of seminary after that, and then another four years of doctoral studies. My beloved Bible eventually matured into a swollen, well-worn artifact. I was in luck because by the time I graduated with a Master of Divinity, however, I found out that Oxford Press had published a Third Edition of the Brick. When I graduated with a Masters, I thought it appropriate to celebrate by purchasing an Oxford Annotated Third Edition Bible. I splurged and bought the leather-bound version. I was living the high life now; and I had a gold-leaf name on the front of my new Bible to prove it. By now, six years later, the leather-bound edition became as well-worn as the original Brick I purchased so long ago. The gilded edges were spotty and the spine grew an awkward fold from a publishing defect. The pages showed signs of slight water damage (how they got wet or humid, I know not). Buying a new Bible can be a daunting task for any Christian, especially when it has to count for something. No one wants to drop a lot of money on a Bible and then not like it after two months–(I had experienced that with that wretched NKJV study Bible years ago). So, choosing a new Bible is a rather serious commitment. What was more daunting was that, this time around, I questioned whether I was going to even purchase an Oxford Bible. There are Bibles on the market that were not available a half of a decade ago. The other Bible that caught my eye was the Wesley Study Bible. I’m not a Methodist, but this Bible has solid notes, devotional sidebars, and handsome binding. Only problem is that it lacks the scholarship of the Oxford, and it is a bit larger than the Oxford (not in thickness, but in width). It just would not do. I also considered other translations. There are so many good ones out these days, from the English Standard Version to the New Living Translation. Both have excellent study Bibles available, and both have a wide variety of leather-bound styling. Then there was the new Common English Bible, published by Cokesbury. If I chose this Bible, I would have to wait for a study Bible [now available] to come along. Well, to make a long story longer: The other day, I decided I was going to make this momentous decision, so I carved out one hour to spend at Cokesbury. I brought along my Oxford Third Edition to get its blessing before I replaced it. That…and I wanted to compare the size of all these Bibles to the Brick. My adventure started with the Oxford Fourth Edition. I compared the binding (didn’t want to get stuck with another defective Bible), leather, page quality, font, and (of course) the study notes with my Third Edition. In the areas of binding, leather quality, font, and page quality, the Fourth Edition is far superior than any of its predecessors (the leather feels like sheepskin, and is quite handsome indeed). The study notes in the Fourth Edition, although similar in many areas to the Third Edition, are actually expanded, and they read more clearly than the previous version. I noticed that a few footnotes alluded to reference passages in both the apocrypha and the Dead Sea scrolls, which I though were kind of cool. 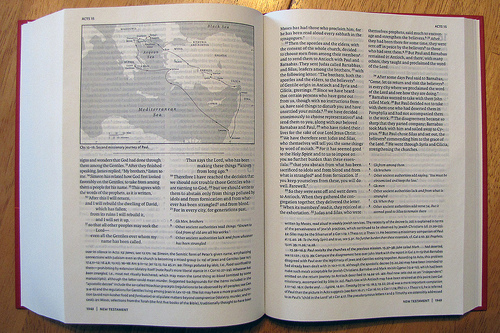 The fourth edition also comes with tables, historical timelines, and a concordance like the third edition; however, the fourth includes a theology glossary. Now how cool is that? The size of the two editions are comparable. It seems that the fourth edition is thinner by a fraction, but I think the binding just makes it appear as much. I really did want something smaller, something I can carry outside of church. So, I left the Fourth Edition there on the shelf and continued to take another look at those other Bibles. After a few minutes searching, an odd feeling hit me: I needed an Oxford. Where would I be without those faithful study notes? How could I read scripture in public if not for the gender inclusive version that that NRSV offers? How would I explain to all of those professors and teachers and colleagues of mine who know how much scholarship means to a person like me if I were to not get the Brick. And before you know it, my bank account was $80 less, and some lady was in the back storage room putting my name on the cover in gold letters. I had committed to being a loyal Oxford customer yet again. What a ride. It hasn’t been a week since I bought the fourth edition Brick, and I have not been able to put it down. Also, the new Brick spent some time meeting its cousins–my former companions–it replaced. Every free moment I get, I transfer my hand-written “notes” from my original hard-cover Brick to the new Brick. And, before my very eyes, I see that my faith journey comes full circle. When I go through those notes, I see just how much the Oxford Bibles have meant to me over the past fourteen years of my life. The original hard-cover Brick, for instance, contains notes from college, my first job as a Bible teacher at a private school, seminary, and, later, my doctorate degree. When I brought the Fourth Edition home, I took a few minutes to fill out the little registration card that Oxford Press includes with all of their leather-bound Bibles. Joe, I noticed that you said the leather was better in the 4th edition. How does it compare to some of the calfskin offerings from other publishers? Also, how is the paper in the leather edition? Is it really thin were there is a lot of see through; or does it have thin but opaque paper? Thanks for the questions. I wouldn’t know about other leather-bound BIbles; my comparison was only with the other editions of the Oxford Bible. The pages are thin, but opaque. I actually use a gel pen to underline and it doesn’t show through. it’s slightly glossy, so pencils don’t work well. Haven’t touched it with a highlighter yet. People complain about the thin paper–it seems to crease easily. I find that to be the case, but, again, better than the other editions for sure. I know you said a lot about the outward appearance of the bible, but what about the validity of whats inside? Did you know that the New Oxford Bible has changed a lot of the meaning of the Scriptures from the original Greek/Hebrew texts? NKJV may be old school but it is biblically accurate! Isn’t that more important than the type of binding or leather? Elizabeth, Thank you for your comment, and I appreciate your point. It is true that I did not spend time exploring the actual NRSV translation, and I am sure there are many articles on the internet that do so. This article does, however, address the Oxford Study Bible specifically for those wishing to purchase or read a review on it. Also, there are some wonderful books on the market, including “The Bible in English Translation,” by Steven Sheeley and Rob Nash. Your point is well-taken nevertheless. Both the NRSV and NKJV have strengths and weaknesses in the translations; and all translations are shaped by certain biases imposed by translators, editors, and publishers. When one translates from the original languages, decisions must be made, language barriers overcome. That’s just the nature of translations! Thanks again! Excellent post and review. I loved the article! I grew up in a very very very conservative area. I am 21 years old and did not know that other translations existed besides the KJV until I was 17 years old. I am now a senior Biblical studies major and the best professor I have ever had recommended and taught out of the NRSV Oxford. The Christian university I go to is very very conservative, and I was wondering, in your opinion, how conservative/moderate/liberal is the NRSV translation itself, and the notes in it? Thanks for the good words and the question. Traditionally (I say traditionally because the Oxford Study Bible has been around for a while), the notes in the Oxford Study Bibles represent mainline denominational interpretation, application and scholarship. It is also ecumenical, which means that there are a variety of views represented in the notes, not just the viewpoint or ideology of any one commentator or school of thought. Usually, when I go through the notes, I can tell what school of thought is represented, be it evangelical, mainline, liberal, conservative, or–in some instances–Catholic, Jewish, or Greek Orthodox. Your biblical studies should help you discern that for yourself as well. In that respect, the Oxford is a great resource, but it is only one of many good resources. Any well-rounded Bible student will have a cache of translations and study Bibles–sticking with only one translation does not provide the varied diet that good biblical scholarship requires. As far as the NRSV is concerned, however, it’s a pretty good translation, and you’ll find it to be a reasonable contemporary to the King James Version. Hope that answers it for you. Thank you for your kind reply, brother. I hate to bother you by asking more questions, but I am a person that has a very worry-wart type personality. I ordered a NRSV 4th ed. NOASB today, but found out afterwards about its ecumenical notes. I understand that my fear is irrational due to the strict right wing upbringing I received, but I am worried that I will go to hell if I do not use one of the “major” translations (i.e. – KJV, ESV, NKJV, NASB). Even though I’m at the senior level of Biblical studies work, I still feel very stressed at the possibility of reading something that could lead me astray. My denomination is probably the least laid back when it comes to believing anything contrary to what they believe, and this mindset has stressed me to no end. Your thoughts are appreciated, as always. Thanks again, JW, and I appreciate your questions! 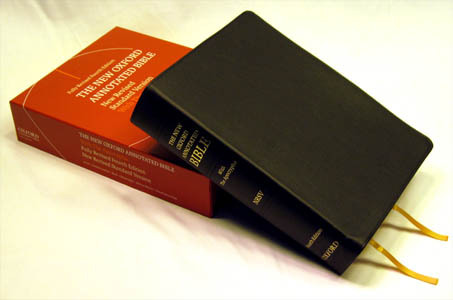 The NRSV is a major translation and is in the interpretative tradition of the KJV. In fact, many would claim that the NRSV is more accurate (and more nearer to the KJV) then, say, the NIV or even the ESV. 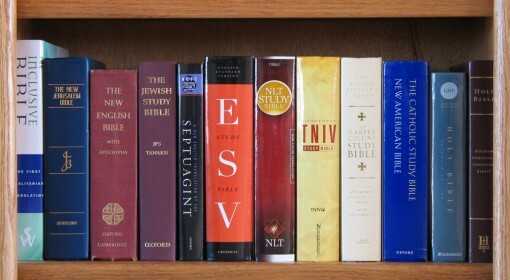 Again, I encourage you to have a variety of translations and study Bibles on your bookshelf. Of course, these things can be collected over time. I, and many Christians like me–and churches I know–use the NRSV for public and private worship, devotionals, funerals, etc. As far as I know, I have not found grounds in Scripture that anyone will be going to hell for reading the NRSV or any other translation for that matter. If God is that strict, then we are all in danger of His wrath for translating the original Greek and Hebrew into another language in the first place–KJV or otherwise. But I read in Scripture that God is love and, from what I can tell, God is not as concerned about these things as we seem to be about it. Thank you for the encouraging words. Are the editors of the Oxford Annotated Christians or just scholars? Do the notes help you grow closer in your understanding of God? The editors are Christians. But those writing the notes are from various backgrounds–either Christian or Jewish. Each book has its own commentator, and the name of the person is listed in each book’s introductory notes (this is a new feature of the NOASB). So if you read the notes in a certain book of the Bible, you can see the commentator’s name in the introduction and look him or her up on the internet. As far as your second question, the simple answer is yes, of course–every resource I use helps me in my understanding of God. Keep in mind, however, that the notes are not like that of the “Life Application Bible” or anything–Rather, the notes are more scholarly in tone for beginner Bible readers. They are meant to help the reader get some context–historical and theological–to scripture, not give answers to every conundrum. I always read through the notes in my devotionals and sermon prep as a way to get introductory material. Sometimes they are helpful and sometimes they are things I already know. I know I’ve said this before, but the bottom line is this: If you want to be a well-rounded preacher, teacher, scholar, or Bible student in general, the NOASB is a great resource to have, but it should be one of many on your shelf. What Bible do you currently use? Study Bible? Being from a small community in Alabama, and being completely ignorant of other translations (as mentioned previously), I have been too paranoid to venture out too far in the realm of Bible study. I currently have copies of the KJV, NKJV, NASB, ESV, and NIV. I have the ESV study Bible, and the NIV Life Application study Bible. I bounce back and forth between NKJV-ESV-NASB usually, but I am hoping to settle on a main translation, and use others only for reference. I want a Bible that I can use and pass on to my future children/grandchildren. Like I mentioned, my favorite and best professor at my school taught out of the NOAB, but coming from a place where people are accused of being “evil” and “liberal” for using even the NKJV or NASB (from what I understand are very evangelically conservative), it has caused me a great deal of stress. I want to have a deeper understanding of the Bible, and grow as a Christian. I don’t have enough faith in my preexisting knowledge to dive right into something like the NOAB, but I have always been attracted to scholarly pieces, not being satisfied with the traditional answers I have received all my life. Some of the answers that have been given to me in life haven’t seemed to click with me, and I know the NOAB could answer those things, but I have an internal struggle: I was raised insanely conservative, but have always had a natural tendency to be more open minded and have always sought left leaning materials. I just need some peace of mind, because in my type of church, it is not very hard to be condemned. One thing that does concern me though, from my understanding the editors do not consider the Bible to be the inerrant word of God. I have many more concerns but I can’t remember them all right now, but I probably will when I get done typing this. Sorry I’ve taken so much of your time but I appreciate you listening to me and taking the time to try and ease my worries. Your very welcome, and it was my privilege to have this comment thread with you! I do wish you the best and hope that you will find the perfect Bible to pass to grandchildren. I know that, for me, it will be the NOASB, but it won’t be for many others. I also appreciate your willingness to venture beyond your own tradition–I think it was Anselm who said that theology is “faith seeking understanding,” and it seems that you are on adventure to discover new ways of approaching both faith on the one hand and understanding on the other hand. I happened to come across an interesting article on the “King James only” movement today in a recent edition of the Southern Seminary theology journal. It said that the KJV “Only” movement is actually a recent movement–only started in the past 100 years or so and reignited in the late 1980s under the direction of several preachers coming out of Pensacola Christian College in Florida, so the movement is pretty young. Additionally, the fundamentalist outlook on the KJV is actually more nuanced than we first assume–not every stream of fundamentalism believes in the exclusive use of the KJV. In fact, many other conservative schools, including Bob Jones University and Clearwater Christian College (not too far from Pensacola) distanced themselves from Pensacola. Anyhow, it was an interesting read–especially when the entire debate focuses on a translation that was made over 400 years ago.